You are cordially invited to participate in the 2nd Edition of Dolls Rendez-Vous Nantes to be held April 1, 2018 at the Quality Hotel Beaujoire (3 stars hotel). As in Paris, this event will also be dedicated to the BJD, Pullip, Blythe and Artist-dolls. Also, contests, workshops and raffles will be held. Furthermore, since booths are limited, we recommend to register as soon as possible. Please note that checks received will be cashed late October. Rooms with kitchenette and breakfast included: Single: € 50 – Double: € 59 – € 84 Triple – Quadruple € 94. If you have questions, do not hesitate to contact us at the email address mentioned above. 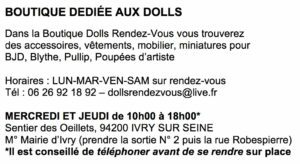 We look forward to seeing you in Nantes for this first edition dedicated to our loved dolls.